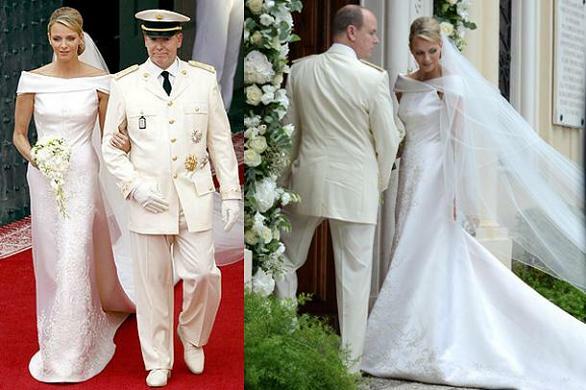 Charlene Wittstock wed Prince Albert in Monaco on Saturday in a beautiful and classic custom-made Giorgio Armani Prive gown. The dress was very simple but looked great on the princess. “The idea was to go for a completely modern look, without any obvious sense of nostalgia or revivalism,” Armani said in a release. Just a week before the wedding, there were rumors that Charlene had bought a one way ticket back to her country of South Africa. Prince Albert and his entourage obviously succeeded at convincing her to come back because on Saturday, a sad looking Charlene wed Prince Albert. Now that’s not a good way to start a life together!